Purple is one of those hues that is either loved or loathed when it comes to home decor — a color even more polarizing than pink. 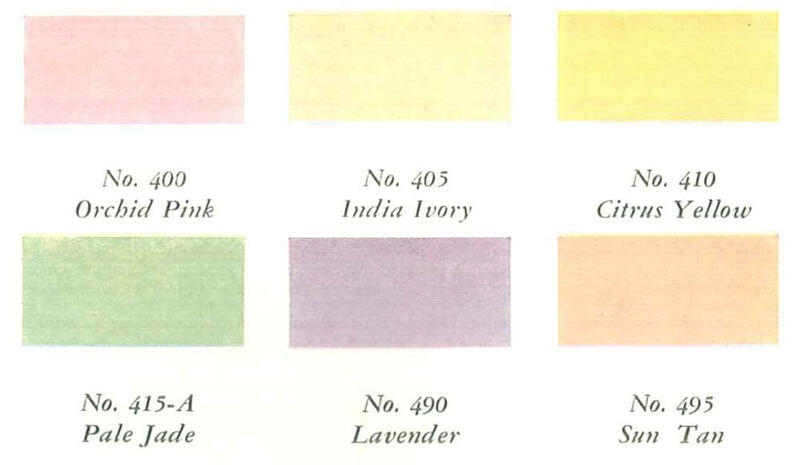 So it should be no surprise that it’s not easy to find a lot of examples of pastel lavender bathroom fixtures in the historical resources we tap. 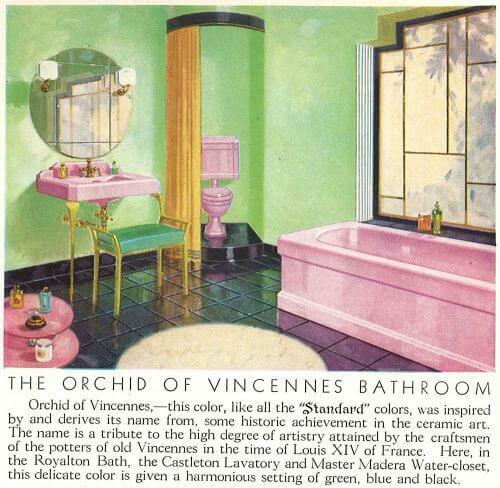 Diving in, I found evidence of lilac / lavender / light purple sinks, tubs and toilets in catalogs spanning 1927 to 1949. 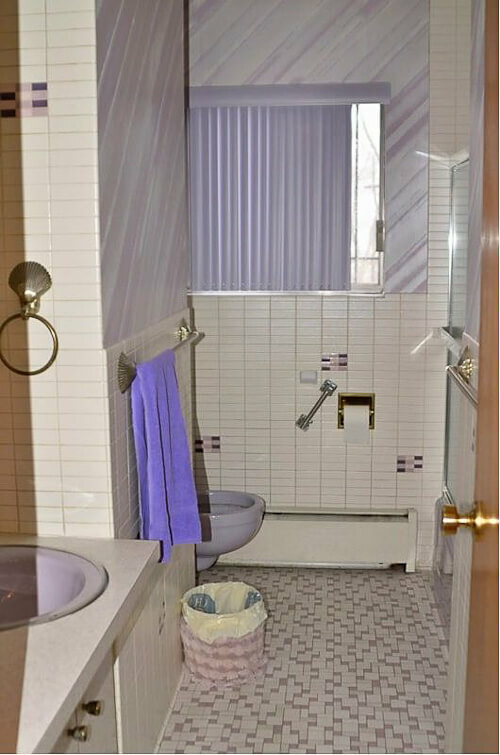 But then, we also have some reader and other examples of 1960s bathrooms with lilac bathroom fixtures — so they must have endured to some degree beyond. 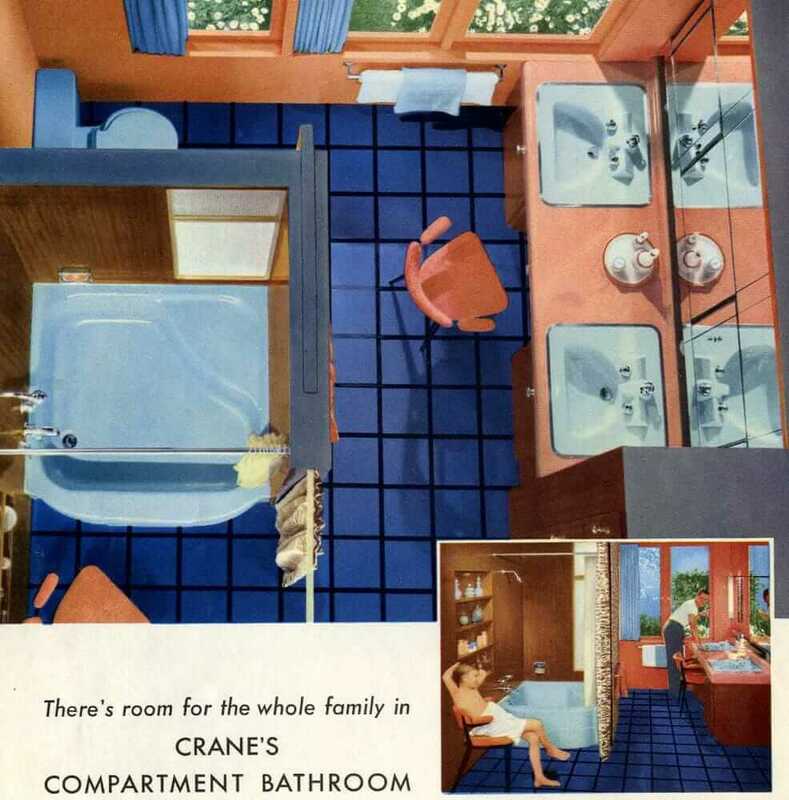 A few years ago, Pam wrote about the very first year — 1927 — that Kohler offered its bathroom fixtures in colors besides white. 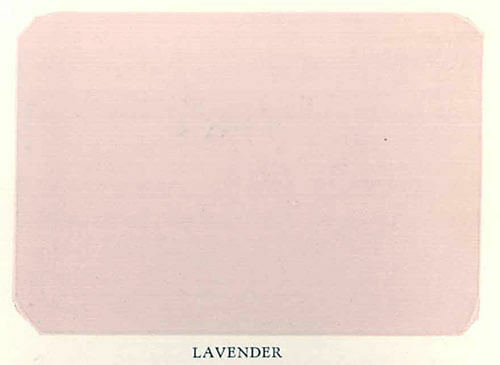 “Lavender” was in the new palette — but is it pink or purple? You be the judge. 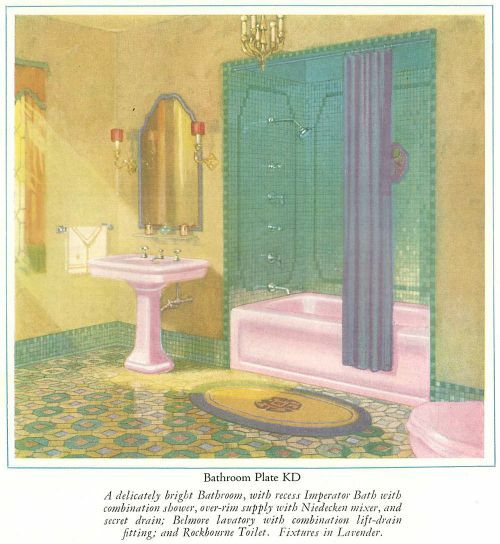 Above: Lavender fixtures from a 1928 Kohler catalog from the MBJ collection/archive.org. 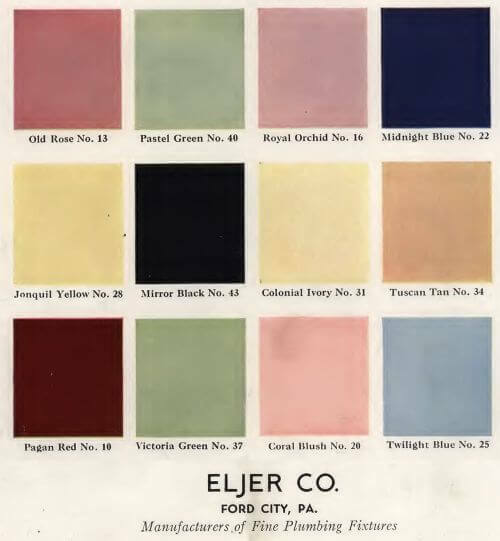 Above: We see Kohler’s color lineup 1936 Kohler catalog from the MBJ collection/archive.org which offered a both a distinct pink and Lavender. 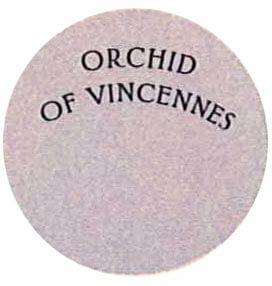 Lavender appears to have been a focus color as indicated by the larger swatch size above. Above: In this 1948 Kohler catalog from the MBJ collection/archive.org, we see the whole palette for the year, which includes Lavender. However, by 1949 Peachblow’s popularity overtook that of Lavender and I no longer saw it in Kohler’s color lineup. You can see by this extensive color timeline on Kohler’s website, that once Lavender was dropped from the color lineup in the 1940’s it was out for good, even while other colors such as pink, blue and green ducked in and out of their color history. Above images: 1930 American-Standard Orchid of Vincennes bathroom fixtures from the MBJ collection/archive.org. Pam spotted this 1939 Eljer catalog in the MBJ Collection on archive.org that lists ‘Royal Orchid’ as one of their offerings. 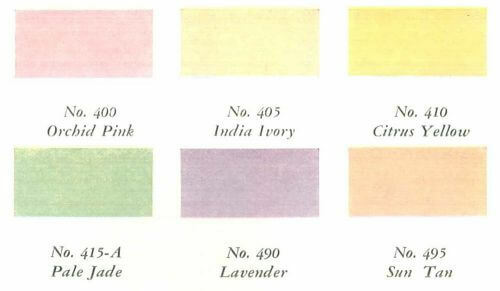 In 1940, Crane offered a Lavender along with Orchid Pink, India Ivory, Citrus Yellow, Pale Jade, and Sun Tan as part of their lineup. Images above from: 1940 Crane catalog from the MBJ collection/archive.org. But wait! 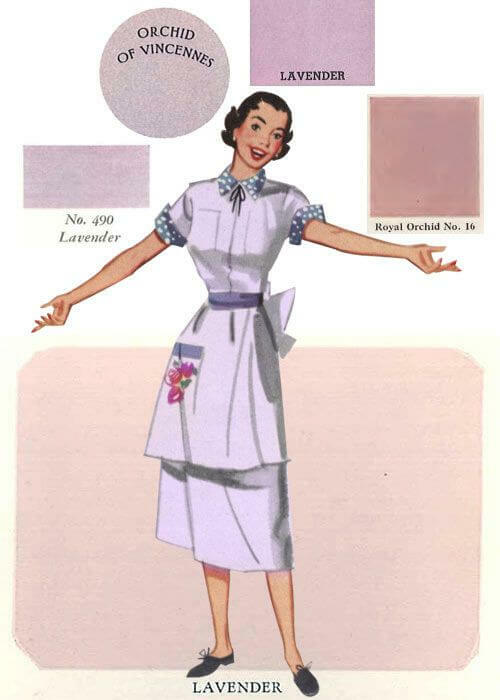 We DID see a lavender or purple or lilac by any other name would be so sweet among the new old stock featured in this story! But but but it’s not on their timeline! Unless… is that really the Pink Champagne” as also seen in the back of the photo but with the color doing funny things on camera? 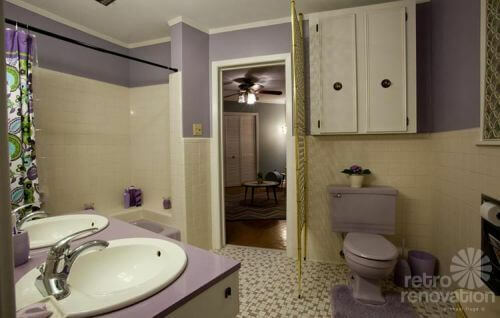 Above: Sarah has a lavendar bathroom in her Gilbert Spindel ‘Round House’. Okay, it’s tile not fixtures, but it’s lavendar in Alexa’s father’s 1951 apartment. And here’s another vintage Lavender bathroom sighting was featured on the blog: This 1960s bathroom that was discovered because the owner was doing some remodeling in their kitchen and bathrooms and was willing to sell these vintage parts on Craigslist. For those hoping to recreate their own purple potty palace, remember: Because Lavender is such a rare midcentury bathroom color, if you do happen to spot a grouping of fixtures and accessories out in the wild at your local ReStore or salvage yard, it is best not to think about it too long, because who knows when another lavender fixture — let alone a set — will show up. My parents built a house 1964-65. It had a beautiful lavender bathroom. 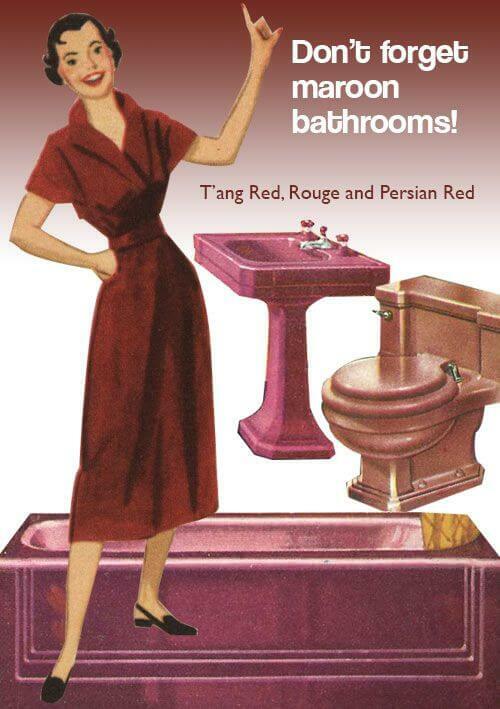 I knew several people with lavender bathrooms. This was in Northeastern Ohio. Maybe color preferences were regional since very few lavender baths have shown up on this site. My mom ordered lavender toilet paper by the case from a local department store! Younger people don’t know that toilet paper and tissues used to come in colors! 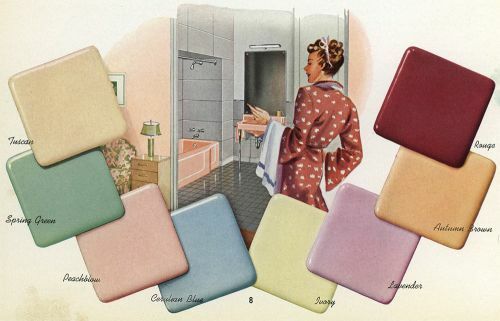 I still love pretty bathroom colors! Don’t wait! There’s tons of inexpensive but well designed/well built mcm furniture that’s easy to repurpose. 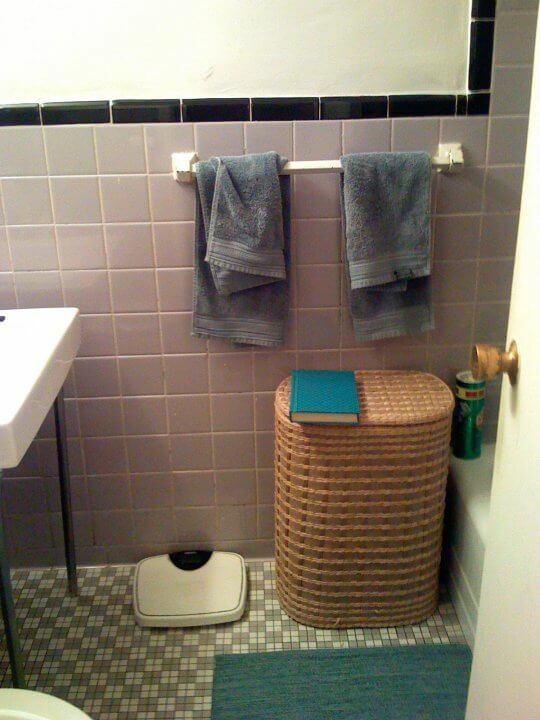 None of my bathrooms have vanities, per se, but used desks, bureaus, etc for a fraction of the cost of new. Oh my gosh! I miss colored TP so much!!! 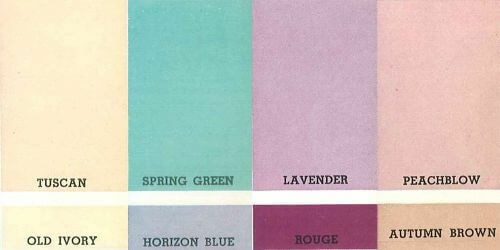 I wish I could get the lavender and the aqua to match my bathrooms!! I don’t know why my reply was under the wrong name, Oops! Oh I know it went out…but it needs to come back! I have seen some available but the colors are too neon. Not thepretthy pastels I remember. I remember it! From the 1980s. I remember playing with and stacking the colored rolls of pink, white, yellow, and blue pastel Scott’s TP rolls! I just liked the colors. In my current house there is an ancient (late 80s/early 90s, my guess) roll of colored, printed TP in the basement toilet. And fun to see the last one in the series pop up. I was just looking at some of the other retro colors just last week. 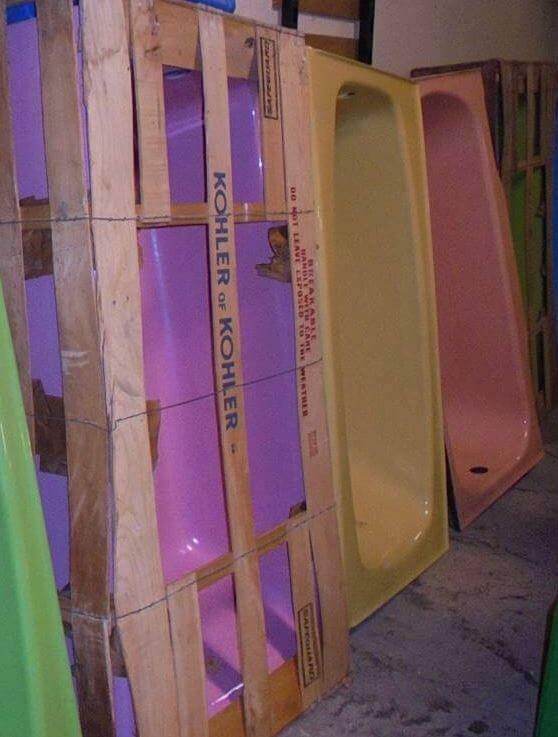 My parents bought a 1966 Deluxe Modular Home (Not Mobile Home) and the main bathroom had the lilac fixtures- tub, sink and toilet. 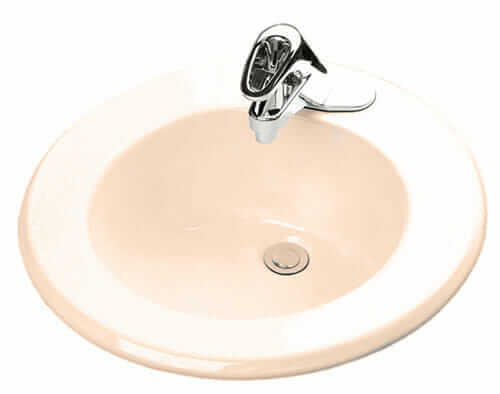 The lavette had a light blue sink and toilet. Mom had lots of fun with purple towels, etc. etc. !